According to the calendar, the 2018 holiday season starts about mid-November. Yet, all the other signs tell us they arrived long before that! I saw my first Christmas ad in late September, if you can believe it. Stores put menorahs, lights, and other stuff on shelves before they moved the Halloween gear to the clearance racks. Since the holidays have been here for weeks already, it’s beyond time to start getting ready for them. The holiday season brings joy, but along with it, comes the pressure, pain and predicaments associated with holiday spending. Too often, we’re tempted to go overboard and max out on gift giving. After all, generosity is a good thing, right? Well, yes, but only to a point. If you spend way too much now, you’ll get tapped out and stressed out. This leaves you with less buying power to spend on things you need when the new year rolls in. Why do even fiscally responsible adults pull out all the stops on their seasonal spending? There are a few reasons. Things like low self-esteem move us to believe that giving extravagant gifts will cause our loved ones to love us more. That's not the case—they’ll appreciate the thought, no matter how humble or highfalutin the present is. After all, the holidays are about love and family and togetherness—not going into debt. Mindful spending habits will help you give great gifts, without leaving you poor when the post-holiday bills arrive. Too often, we’re tempted to go overboard and max out on gift giving. We’ve made you a list. Now, check it twice to help you manage your holiday money better. Then, you can start 2019 in better financial shape. Look at your income, savings and expenses to determine how much you can afford to spend on gifts. As much as you might want to go above that figure, don’t—and whatever you do, don’t max out all your credit cards to get all those presents. Make a plan and create a list. According to legend, Santa diligently keeps track of who’s getting presents every year, and what they’re getting. Your list of gift recipients is smaller, but it’s still wise to scribble down who you’re buying for, and a modest gift or two for each of them. That will help curb purchase of impulse presents and keep you from buying for people you don’t need to. Social media platforms like Twitter and Facebook are especially great for getting ideas from other people in your circle. Post questions like, “What’s your favorite gift?” or “What do you think is a great $20 gift for a female friend?” The answers can help you pick out gifts that will delight, without breaking the bank. Stuff your stocking with extra cash. Say what you want about the gig economy—it’s great for making a few extra bucks on a flexible schedule. Stores are hiring for the holiday, as always. Services like Lyft, Instacart, Postmates and others see an increase in business this time of year, too. Sign up, work a few hours a week and soon you’ll have saved up some extra holiday dough. Cut back other types of merriment. 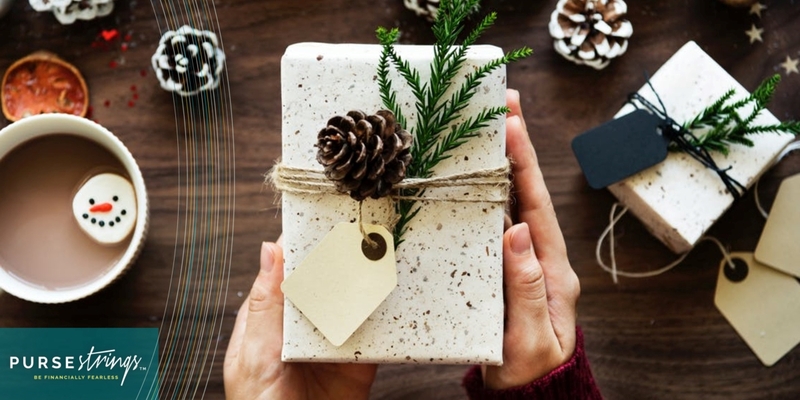 If you spend a little less on non-essentials for yourself, you’ll end up with more spending power for holiday gift-giving. For example, one less dinner out next week could mean an extra present under the tree. Even curbing your latte addiction to one less drink a week adds up. Look at your income, savings and expenses to determine how much you can afford to spend on gifts. If you’re worried that mindful holiday spending will turn you into a Scrooge, don’t. It just leaves you in better financial shape after the presents are unwrapped. That’s a concept that should make you merry. Subscribe to the Purse Strings Newsletter and stay in the know all year round.